← Bakersfield To Palmdale, High Speed Rail Is Coming! 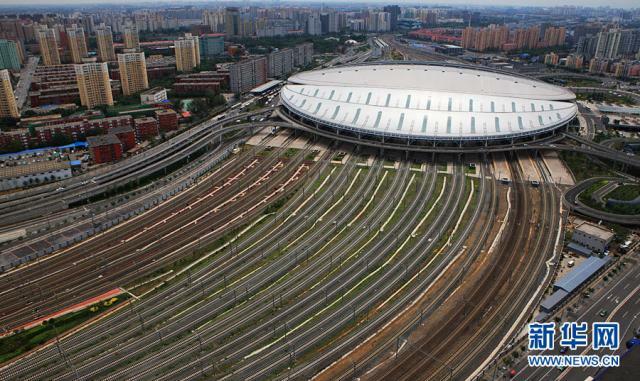 Well, I was on the Internet today and I came across an astounding picture of the HSR train terminal in Beijing, China, which you can view here with this blog post. Take a look at it. I mean, take a serious look at it. Are the terminal and the railways leading in and out of it not a feat of unbelievable engineering and construction, or what? I almost feel like saving up all my money over the next several months so I can travel to China just to ride one of the world’s fastest trains and arrive at this magnificent feat of architecture and engineering and feel its immense presence. Really. While I know it would be exciting I also know that more than a little sadness would come over me after I had experienced high speed rail and the HSR train terminal in Beijing. For it will pose a question to me I know I cannot answer. That simple question is: Why don’t we have high speed rail and a magnificent modern train terminal like this here in the United States of America? HSR is underway in California and there are a number of other high speed train routes being seriously discussed from coast to coast. Let’s wait and see if I get the answer we all need. I am the owner of Bolts Creative, a full service marketing agency. We develop innovative marketing plans and strategies for your business and can execute them in the most fabulously creative ways on the web or in print. We provide brilliant branding, content writing and breakthrough graphic design to enhance your image, set you apart from your competition, and convince your customers that you are the company of choice. This entry was posted in Vision and Leadership and tagged China HSR, hsr China. Bookmark the permalink.